Case Knives USA, Muskrat CA056 folding pocket knife, made in the USA. Measures 9.5 cm (3.75 inches) closed, chrome vanadium steel, 7cm (2.8 inch) blades. Ideal every day carry pocket penknife. 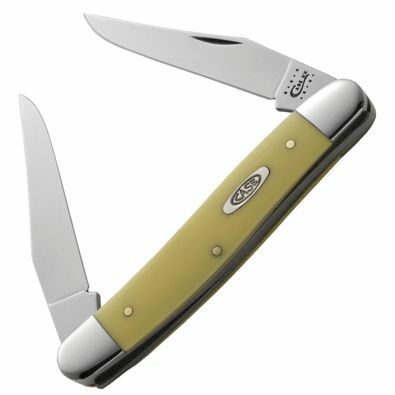 Brass handle liners, synthetic yellow handle scales, nickel silver bolsters. This pocket knife offers maximum UK legal blade length in a slim package. It carries very unobtrusively in a trouser pocket or even in a shirt pocket, under a pullover or jacket. The thin blades are more versatile than they seem at first. It makes a quick and tidy job of cutting an apple into segments, with very little waste. In fact the Muskrat does very well in the kitchen and would make a good choice to bring along on a picnic. CV steel will patina, of course, and it does leave a slight taste, being carbon steel. But that's all part of the charm. If you have never owned a carbon steel knife before, they are very easy to maintain; common sense, really. Just oil the blades now and then, for food prep, olive oil or cooking oil is fine. The joints are best oiled with light machine oil. Never put it in your dishwasher. The Muskrat also makes a fine whittler. The weight to blade length ratio makes the Muskrat light in weight but big on performance. A somewhat overlooked and underrated pattern amongst traditional pocketknives, yet well worth considering. Highly recommended!